Surfing in the Pacific Ocean in the middle of winter sounded like a crazy idea to me until I was invited to try it with some friends. I jumped at the opportunity to try something new even though I was a little nervous about the cold water, sharks and lack of experience. The only time I tried surfing was in Hawaii, so needless to say, this was going to be a little different. Luckily I was going with a group of experienced surfers so I had nothing to worry about. 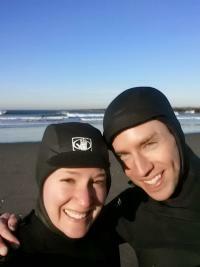 I rented surf gear (board, wetsuit, booties, and hood) from WaveHounds in Seattle and the next morning we packed snacks, made coffee and crammed everything in the car so we could hit the road before dawn. The drive to Westport, located on the Washington Coast, from Seattle took about 2.5 hours including a sunrise and a stop to get gas in Olympia but we made it and it proved to be a beautiful sunny January day on the beach. We pulled up to the sandy parking lot at Fairhaven State Park and squeezed into our wetsuits, waxed the boards and hauled them up over the berm down to the beach. The waves were pretty high and intimidating for a newbie like me but for the regulars, they were your average 6 footers. We did some practice on the beach going from the lay down paddle position jumping up into surfing position. That was the easy part, where balance came naturally. Finally we decided I was ready to get out there and test out my new skills. I&apos;m not going to lie, it was pretty hard. The part I was most worried about was getting cold while swimming in 45 degree water but my wetsuit kept me nice and dry and toasty warm. After about 2 hours of paddling, jumping up, falling off and doing it all over again I was starting to get the hang of things but also tired and hungry. I decided to head in a little early and wait for the group to finish up. Once everyone returned to the beach we went back to the car and changed out of the wetsuits into warm and cozy sweats. After the full-body workout surfing provides we were all starving so we decided to drive downtown to grab a bite to eat. 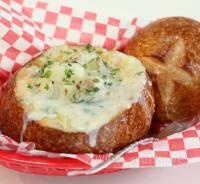 We stopped at Bennett&apos;s Fish Shack and gobbled down clam chowder bread bowls, fish & chips and burgers. After stuffing ourselves, we piled back into the car and headed home where I enjoyed a well-deserved nap. 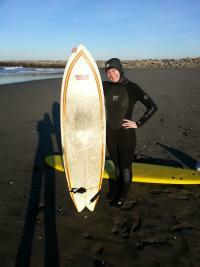 I survived my first winter surfing experience in the chilly waters of the Pacific Ocean and I don&apos;t think it will be my last. Note: You will need a Discovery Pass to park in the Fairhaven State Park lot. There are two surf shops in Westport where you can rent gear: Steepwater Surf Shop and the Surf Shop in Westport. Make sure to call ahead and check open hours and availability.